Whether you rate your marriage at a 1 or a 9, re|engage is a ministry that is built to move husbands and wives toward oneness. 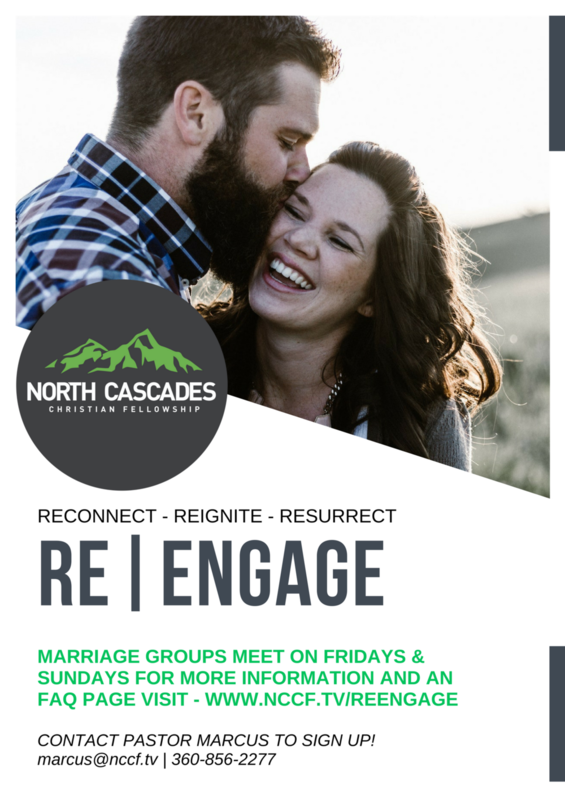 re|engage is our Marriage Discipleship ministry which provides a hope-filled environment for husbands and wives to reignite, reconnect and even resurrect their marriages. Marriage Discipleship strengthens each individual’s personal relationship with God so that the foundation for marriage is Christ-centered and strong. Only by experiencing God’s grace in your own walk with God, can you freely extend grace and build a stronger relationship with your spouse. Join us for an experience that will include biblical teaching, testimonies of hope from couples who have experienced victory in the midst of hardships and small group time. re|engage meets once a week for approximately one hour and has two major components: Open Group and Closed Group. Open Group is for couples that are not yet in a Closed Group. Open Groups are a great place to begin working on your marriage. Fall Semester Begins September 16th!! This class is intended for Married Couples, but if only one person can attend on a given week, that's okay. This is an open group, which means new people can attend on any given week. Childcare is available through our NCCF KIDS program during the class time. There is $25 cost for the materials. 1 workbook per person. This class is intended to be taken by Married Couples only. Both need to come to the group meetings. This is a closed group, which means the group will not allow new members after week 1. You do not need to be a member or even attend NCCF to come.